At the south west corner of the churchyard is a range of buildings known as Church House. In pre-reformation days this site was occupied by a small religious house for six monks and a prior. Between the Reformation and Queen Anne’s time it may have served as the house for the parish priest. At the beginning of the nineteenth century Church House was converted by Countess Lady Conyngham into three almshouses, with a fourth reserved for the parish clerk. In 1927, the advent of Old Age Pensions having made its former use unnecessary, Major Conyngsby Disraeli bought the cottages with a view to making them into a parish hall. When work began a number of long beams were discovered, and the work which started as a conversion job quickly developed into a work of restoration on which Major Disraeli would allow only a small group of expert craftsmen to be employed. Major Disraeli undertook much careful research to ensure the accuracy of the restoration, and the building now closely resembles its pre-reformation appearance. Church House is now much used by the church for Church House Teas, Junior Church and outside bookings. To book Church House contact the parish administrator. The story of the restoration of the old Church House at Hughenden includes a rather wonderful coincidence. 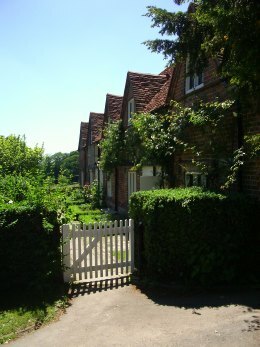 A fifteenth century two-storied brick building that stands near the Church had, for many years, been used as four almshouses under one roof, but with the advent of the old age pension, the cottages fell empty and the usual decay set in. A Church Hall was badly needed and the little row of almshouses was the only building near at hand; so I decided to clear out the dividing walls, chimney breasts and bedroom floors and contrive from the middle part a hall for meetings. I proposed to keep the dormer windows of the middle cottages as upper lights for the hall, which would take in the whole height and depth of the building, but not the whole length, as we should want space for storage of chairs and other gear. When the workmen had dismantled the chimney breasts, and removed the floor of the upper rooms, they began to strip the old plaster off the interior walls. This revealed the half timber work, and I noticed a much longer sweep in the beams than is usual in cottage building. I gave the order to go carefully, and before long my suspicions were confirmed. The hall we wanted was already there! When the walls were stripped we found still intact the complete timbered framework of a beautifully proportioned hall with a high arched roof. What had for so many years been the roof of the bedrooms had for some centuries before been the roof of the ground floor. The bedroom windows of the almshouses had lit the same hall as the lower windows - precisely what I had planned to do with them in my own scheme. 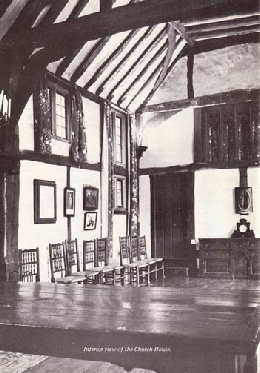 A finely tooled grille of timber high in the wall at one end suggested the reading loft of a refectory, and as one detail after another came to light there was no longer any doubt that we had discovered the old manor house of a pre-Reformation day when the manor was still in ecclesiastical hands. The cottage we had spared at the end was apparently the Clerk's house whence he presided over the little brotherhood of priests who dined in the hall. Yet further evidence was forthcoming when we found that the building was a cellared one; cellars in the fifteenth century were still a luxury. Before the main door stood a well, and opposite the property on the banks of the Hughen there is evidence of the water mill where doubtless they ground their corn. The old mill cutting is still to be seen. Fish they would also have had from the Hughen, a trout stream. The work of restoration took us about three years and the little team of carpenters and masons seemed to enjoy it thoroughly. To me it provided an endless source of pleasure, and I was sorry when the absorbing task of directing the operations was at an end. But we have our Church hall - not a modern affair, out of keeping with the ancient sanctuary to which it ministers, but itself a relic of the religious community that once held the lordship of Hughenden. ndeed in some ways the Church House is a more historic building than the Church itself. For the latter was pulled down - tower and all - in the philistine period of the last century, when Lord Beaconsfield was, so to speak, not looking, being too immersed in affairs of state. The Church was merely rebuilt. The Church House has been faithfully restored.